The Hairhouse Warehouse Blitz Hair & Beauty Mega pack has been in stores for around 2 weeks now, and is excellent value at $34.95. As you know I was sent one for review, and there are 5 to give away! The names of The Blitz giveaway winners are at the end of this post. Here is what's contained in the pack - $150 worth of value for $34.95. RPR Brighten My Blonde Shampoo and Conditioner (300mL) OR RPR My Hydrating Shampoo and Conditioner (300mL) - I was sent the My Blonde range, and having very dark brunette hair I wasn't game enough to try these. The range claims to remove unwanted brassiness and yellow tones from hair. I'll be giving these two away to a friend who has fair hair, and if she is game enough I'll convince her to review it here later. RPR Protect My Hair Thermal defense spray (300mL) - This absolutely smells delicious, of wild berries. It's quite strong at first but does go away after a while if you don't like berry smells. I used it just before straightening my hair with GHD and it made my hair noticeably smoother. Plus the fact that I knew it was protecting it from heat made me worry less about the damage I'm doing to my hair. RPR My Quick Fix Dry Shampoo (150g) - This is definitely one of the better dry shampoos I've come across in terms of performance. Normally with dry shampoos I spray them on unwashed hair in the morning but after about 4 hours my hair starts to feel greasy again. With this one I went for almost a whole day without the greasy feeling. The only thing I didn't like about it is that it sprays white, so on my dark hair it took some rubbing and brushing to get rid of the white residue. RPR My Argan Oil Elixir (60mL) - This is a hair oil that you can use on wet or dry hair. The first time I used it I applied too much and it left my hair feeling very limp. You only need the tiniest amount, think the size of your pinky nail, and it will work great. The way I've been using it is when I dry then curl my hair, I spray this on the ends for definition and shine. It won't replace my beloved Moroccanoil, but it's definitely something good to have in your handbag for emergency touch ups or for travel. Vent Brush - Fairly standard vent brush really, doesn't do much for me as I prefer a round brush. Mini Dryer - For a mini dryer this packs a punch. It's perfect for traveling with as the handle folds to make it more compact. Plus I always like having a spare hair dryer at home as I have this weird fear that one day at the most inconvenient moment my normal dryer will die and I'll have no way to dry my hair! (I have very thick hair that holds on to water and takes forever plus infinity to air dry). Models Inc Lipstick - This I'm sorry to say I didn't like. The lipstick smelled a bit off and because of the smell I couldn't even swatch it on my lips. But considering everything else is such great value I can't really complain! It's definitely excellent value if you want to try out some new products. It retails for $34.95 but you get 8 full sized products plus a voucher, adding up to $150 value. They are on sale now at Hairhouse Warehouse stores nationally. 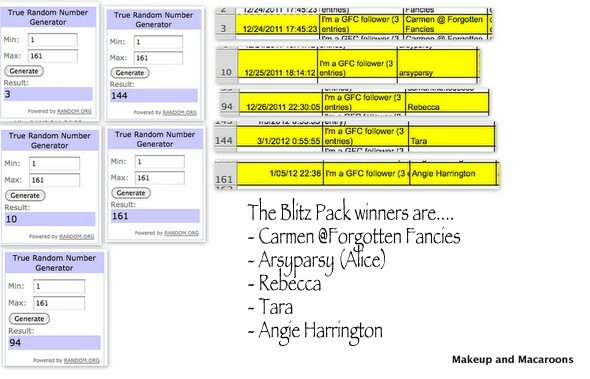 And now to the 5 lucky winners of a Blitz pack each who have been chosen randomly via random.org. They have all been contacted and have until 10th January to get back to me. And don't forget that my makeup giveaway is still open until 13th Jan so if you haven't entered yet here is the link. PS: the skincare giveaway has also closed, but I'm still counting the entries as there were quite a lot.